I added another type of tassel in my Vintage Halloween Garland post. 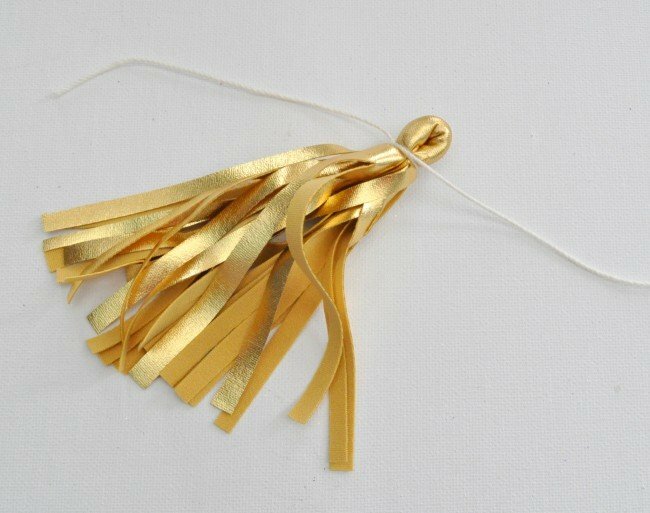 I made these pretty gold fabric tassels! At the rate I’m going, pretty soon I think the blog will have covered every way to make possible to make a tassel! Ha! The tassels I made ended up being 5 inches long when finished. So cut your fabric to 11 inches x 3 1/2 inches wide. Fold the fabric in half. 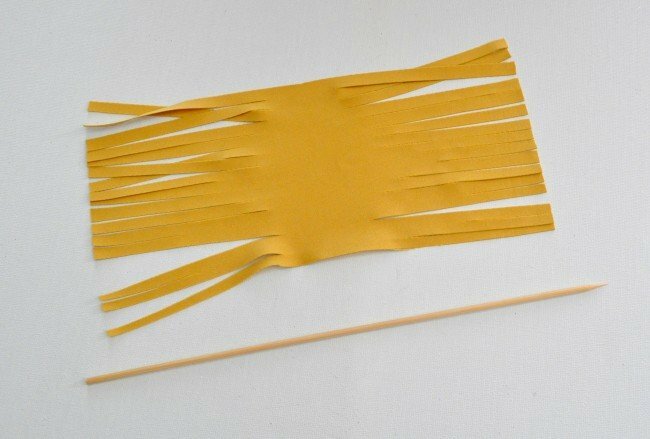 Cut thin strips across the fabric, ending up at an inch from the fold. Unfold the fabric and lay it with the back unfinished side up. Lay a wood skewer on the edge of the fabric and roll tightly. Remove the skewer. Fold the rolled fabric in half. 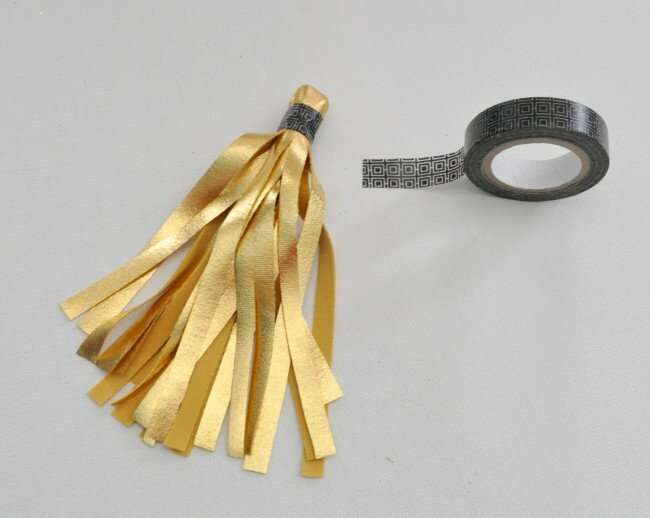 Note: To hang the tassel, at this step you can add a jewelry ring in the tassel loop or add a string to hang the tassel. Tightly double tie a string 1/2 inch from the loop in the fold. 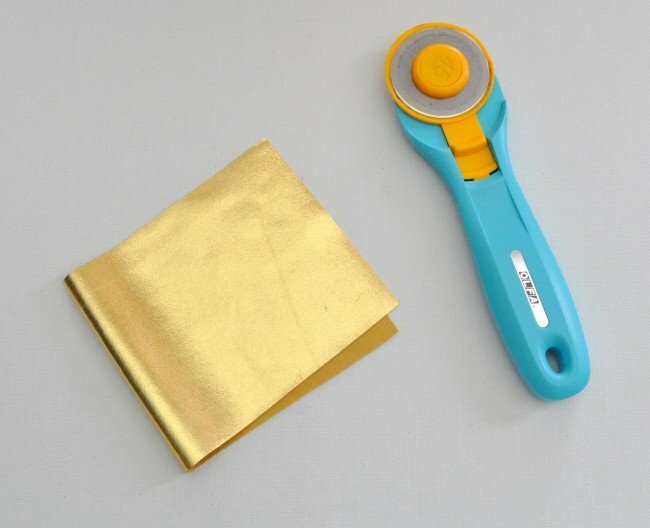 Take the Washi tape and wrap over the string and cover the knot. And that’s it! You have a simple but pretty tassel! Here are the Fabric Tassels on my Vintage Halloween Garland! Oh I love this! 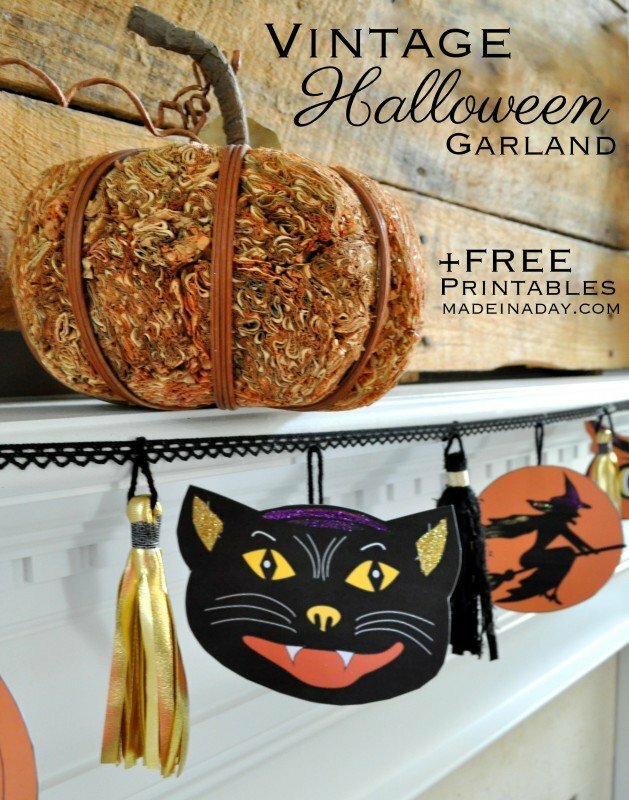 I love the Halloween garland with the tassels and to think it is so simple! Thank you for linking up with us at the Tips and tricks Link Party! I cannot wait to see what else you have to link up at tonight’s party! 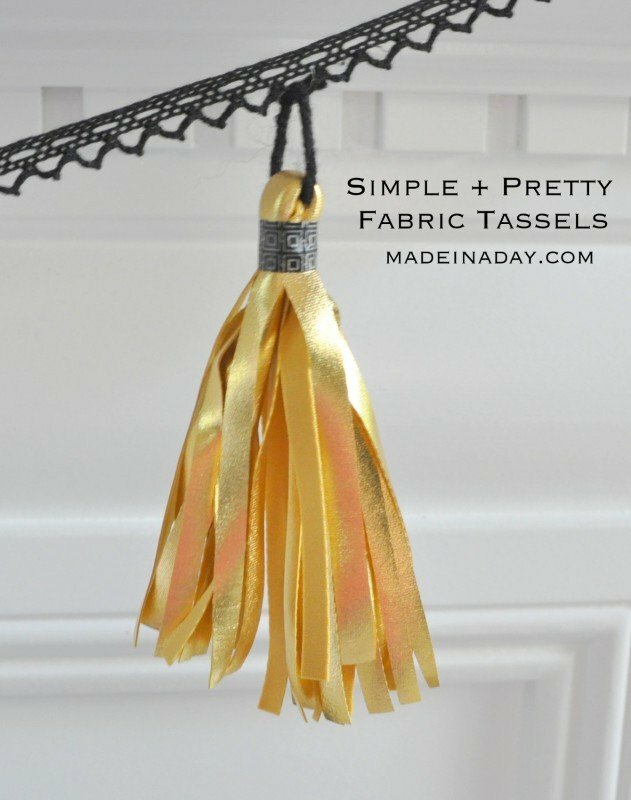 Your gold tassels looks gorgeous.Thank you for linking with us at #HomeMattersParty. We would love to see you again next week. I love your crafts. The halloween garland is so cute. I’m not very craft, but I think I can manage the tassels. Here’s hoping… Joining your from Create with Joy. Thanks so much Ginger! 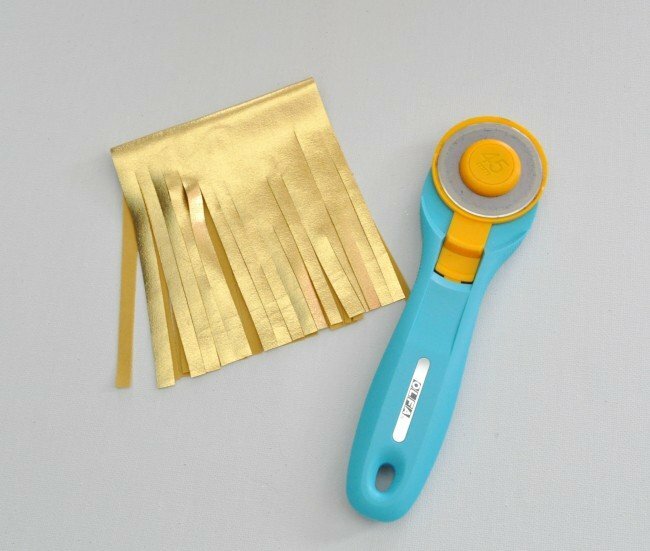 Those tassels are so simple the Washi tape is the best! Glad you stopped by~!